We are architects with love and passion for interior design. We believe in listening closely to our clients and paying attention to details. We turn raw ideas into plans for comfortable, livable, inspired buildings and residences. We create more than a house; we create a lifestyle! Contact us today! Specializing in contemporary design for the Residential client. all that includes remodeling and/or décor. Drawings, advice in placing and buying furniture. Wall colors consultation. Rugs, window treatments wallpaper, custom furniture design. 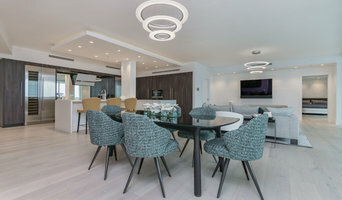 Michael Fine Design is full design and construction management company providing full service oversight from design to construction completion. Brenner Architecture Group is a multi-faceted architectural design firm driven by the ideals of superior design, progressive thinking, and strong client relationships. Every client is unique. So is every home we undertake. Pioneer is with you every step of the way, from design to fruition of the project. BBH Design Studio stems from the merging of two offices with vast experience in architecture, interior design and construction. BBH Arquitectos and DFB Designs LLC. BBH Arquitectos is born in 2002 from the fusion of two architectural offices: Caleidos and SF Proyectos y Construcciones in Caracas, Venezuela, represented by Sete Bentata de Bassan and Hani Hausmann de Flicki. Both firms with extensive recognized and awarded trajectories spanning in the Architecture, Interior design to Urban design fields. In the year 2011 BBH Arquitectos merges with DFB Designs LLC an interior design company directed by Debbie Flicki Bloch, based in South Florida resulting in the creation of BBH Design Studio. International Architectural + Interior Design firm based in Miami, providing services from space planning, 3D Modeling/renderings to full on remodels and everything in between. Accolade is an architectural, general contracting and interior design firm specializing in luxury residential projects. We have developed a reputation for excellent work and high client satisfaction. Our mission is to provide a better quality of life to our clients with thoughtful and creative solutions. We specialize in architecture, display design, and project management. KoDA is an award-winning, multi-disciplinary design firm focused on seeking creative solutions to spatial and programmatic challenges. The firm approaches each design with a sensitivity to context and sustainability while maintaining the integrity of their clients program. With a background routed in master carpentry, they approach the practice of architecture as yet another craft. There are no pre-conceived notions of style, form or materiality, but rather a careful evolution of a particular idea. Specializing in innovative architecture and interior design, KoDA believes that each project has a unique story to be told. Through an analytical design process, KoDA identifies the narrative that provides their projects with unprecedented creativity and avant-garde character. Padko Investment is a design build firm offering a broad range of services. We have vast experience in the construction & management of large projects & developing and designing residential projects. Sdh studio is a Miami-based architecture and design firm led by Stephanie Halfen. Founded in 2009, sdh is a young, innovative practice that focuses on creating spaces that inspire.